Venues see big advantages to turning the taps over to customers. 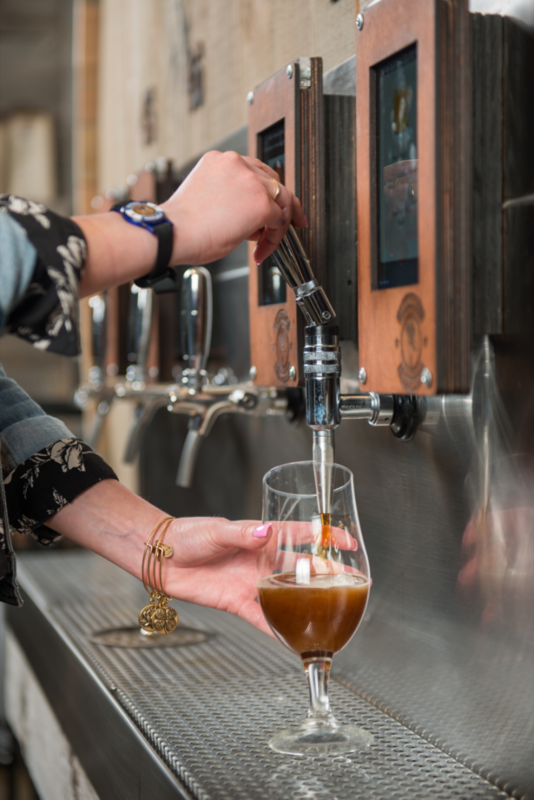 Self-serve draft rooms (Barrel Republic taps above) create community atmosphere for craft beer enthusiasts and maximize efficiency for on-premise operators. Bars around the country are increasingly featuring self-serve beer walls to offer consumers flexibility and convenience. The draft systems use technological advances to accommodate dozens of brews while allowing patrons to control pour sizes and reducing costs for operators. “We’ve seen a huge uptick in interest from bar operators in the past year,” says Josh Goodman, founder and CEO of Pour My Beer. The Chicago-based company provides the technology required to outfit on-premise venues with beer walls, and it counts Marriott International Hotels and the airport food service company HMSHost among its clients. Pour My Beer and other similar vendors use radio-frequency identification (RFID) technology to allow guests to prepay or set up tabs for their drinks. Then they simply scan cards or bracelets on tablets installed above the draft handles. The technology allows consumers to customize their pour size, ranging from 1-ounce samples to 16-ounce pints. The pay-by-the-ounce approach to draft beer is interactive, according to Nate Tomforde, founder and owner of the three-unit Pour Taproom concept in North Carolina, South Carolina and California. “Customers don’t have to wait to be served,” he explains. “It also gives them the freedom to pour small samples to find out what they like and don’t like.” Pour Taproom offers up to 70 different beers, ciders and wines on tap, with beer prices ranging from 25 cents to $1 an ounce. Bar operators say self-pouring also helps establish a more social environment. “It creates a community atmosphere,” says Mark Slattery, owner of First Draft in Denver. The venue opened in 2015 with 40 self-pour beer, wine, cider and kombucha taps. The concept—which charges between 40 cents and $1.20 per ounce of beer—has been so successful that a second location is planned to open later this year in Downtown Los Angeles. The self-serve option has attracted new drinkers and beer aficionados who don’t want to buy a full pint of beer, Slattery adds. Our ‘Freedom to Pour’ concept gives our patrons the opportunity to get off their stools and walk around tasting and socializing with other craft beer lovers. At each of the three Barrel Republic units in the San Diego market, the beer wall features about 50 different drafts, with prices ranging from 43 cents to $1 an ounce. The concept launched in 2013. “Our ‘Freedom to Pour’ concept gives our patrons the opportunity to get off their stools and walk around tasting and socializing with other craft beer lovers,” says owner David Pike. Equipping on-premise venues with self-serve beer walls can be expensive. Depending on the number of drafts, up front costs can exceed $80,000, Goodman says. In addition, self-serve beer venues may require special licensing approval, particularly due to concerns over monitoring self-pouring guests, although the systems are typically set up to require that guests be assessed by bar staff after consuming 32 ounces. Furthermore, as with other advances in technology, the use of tablets and RFID cards can invite a host of software-related problems.